Angela and Jason: can this marriage be saved? 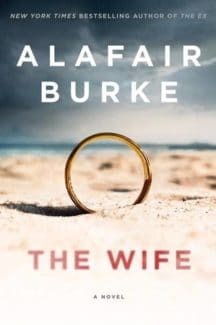 Alafair Burke’s assured new book, The Wife, is billed as a novel of psychological suspense. Indeed: it’s one of those twisty, unsettling stories that takes your hand, tugs you along, and doesn’t release its grip until you look around and realize you have no idea where you are. The Wife unpacks the six-year marriage between Angela and Jason Powell. Angela is a former caterer with a disquieting past. Jason is a charming economics professor renowned for his books and media appearances (think Steven Levitt and Stephen Dubner of “Freakonomics” fame). They live in Manhattan, possibly beyond their means, with their son, Spencer. From the get-go, the reader perceives that Angela’s got some big secrets. “We were supposed to have a normal marriage, but one half of the couple—me—wasn’t normal, so neither were we,” she says. She cheerfully clings to her routine as a wife and mom; the more quiet and uncomplicated her life, the better. One can imagine her horror, then, when Jason—who promotes gender equality in the corporate sphere—is accused by two colleagues of sexually inappropriate behavior. Police officers show up at the house, and the Powells’ marriage is turned on its head. What crimes has Jason committed? What does Angela know? Is she complicit? Burke, who is both a prolific writer and criminal law professor, is masterful at crafting a well-paced and richly plotted novel. The magic of The Wife lies in her mind-boggling sense of restraint: she manages to sustain the feverishness of the story while parceling out just enough information to keep the reader hooked. This disciplined, measured way of disclosing details ultimately packs a huge punch: by the end of the book, our assumptions are in tatters. The Wife tosses imperative questions at readers. What is evil? Is it ever justified? Can we be certain of something beyond all doubt? Is knowing something different than believing it? Burke, who cleverly coaxes readers away from a sheer black-and-white mentality, forces us to sit with the discomfort of these very gray concepts, even if we never arrive at any firm conclusions about them. The narrative style of The Wife certainly enhances its intrigue. Burke alternates chapters between first person and third person omniscient. In this way, we move from Angela’s intense, prickly mind to the perspectives of more entertaining characters like Detective Corrine Duncan, Assistant District Attorney Brian King, and Angela’s mother, Ginny. As for Jason: his inner voice and motivations remain—maddeningly, effectively—off-limits to us. Burke, a former prosecutor, clearly loves the intricacies of the judicial system. She weaves a good deal of legalese into The Wife as cases are brought against Jason. I suspect this jargon makes perfect sense to anyone with a J.D., but it becomes a bit dense (and sometimes hampers the story’s momentum) for those of us who aren’t lawyers.